Personal security is more important than ever before. In the past, surveillance of one’s home and property was costly and inconvenient due to poor quality footage and archaic methods of video recording. But, the technological advancements in handheld and wireless technology during the last 10 years have made security and surveillance easier than ever before. Now anyone can set up a cost-effective wireless camera system on their property. The question is which camera brand and model is the best fit for your home and situation. In this guide, we will be covering some of the best outdoor security cameras and surveillance systems on the market to better find which works best for who. Blink was originally a startup that gained its backing via a Kickstarter campaign that was able to crowdfund over $1M from about 7,000 pledgers. Now Blink is owned by Amazon since the end of 2017 when Amazon purchased Blink for $90M. Blink has two cameras currently available, the Blink indoor security camera and the Blink XT outdoor security camera. We will be focusing on the Blink XT. The Blink XT outdoor security camera has an IP65 rating, meaning that it can withstand rain and other intense weather conditions. One of the more outstanding features of the Blink XT is that it is completely wireless with its power supply. Blink XT is powered by 2 AA batteries and its battery life can last up to 2 years. Along with the power supply, all of the footage is transferred over WiFi so no wires are necessary for the installation. The Blink XT films in 1080p HD with its 110-degree lens and films up to 30 frames per second. Motion sensing technology activates the camera and alerts the owner’s smartphone of movement detected. Night vision is also included enabling the camera’s visibility in low lighting. A microphone is included so the owner can hear what’s happening in front of the camera, 2-way audio is not supported. Video footage is stored on the cloud free of cost. Blink XT is integrable with Amazon Echo devices, allowing the owner to control their Blink XT by voice. The Blink XT costs about $80 for a 1 camera system and can support up to 10 cameras on a single system. A 1-year limited warranty is included with purchase. For the cost of about $80, the Blink XT packs many features inside itself for a cost-effective and weather resistant design. The lack of wiring needed for the installation process makes placing cameras around the home easier than traditional wired outdoor cameras. Free cloud storage is an excellent additional feature. Direct integration with Amazon Alexa is an excellent feature but we would like to see integration with Google Home as well but seeing as Blink is an Amazon company we doubt direct integration will happen. The lack of 2-way audio is a slight drawback. A 1-year warranty is adequate for a product of this price. Next up, we have the Luowice security camera. Luowice is a Chinese company that specializes in outdoor surveillance cameras. They do not have their own separate e-commerce site and all of their North American sales are through their Amazon page. The Luowice security camera has an IP66 rating meaning that it can withstand more extreme weather conditions than the Blink XT that has an IP65 rating. One of the best features of the Luowice security camera is its 2-way audio function allowing it to function as an intercom speaker. The camera connects to WiFi allowing the owner to view the camera any time via their mobile device. The camera is outfitted with motion sensors which immediately alert the owner via email or the mobile app when there is camera activity. The night vision feature allows the camera to see up to 100 feet during the night. The camera has a 180-degree wide angle lens and can be panned from left to right. This camera films in 1080p HD can capture up to 25 frames per second. Installation can be a bit tricky as this camera is not powered by a battery and must be plugged in to maintain power. Video footage is stored locally via an SD card and can support an SD card up to 64GB. To maintain continuous recording, the Luowice will delete the oldest footage when the SD card is full. The Luowice security camera costs about $60 and comes with a 1-year warranty. The Luowice camera is quite inexpensive for all of the features it supports costing about $60. The 2-way audio feature is excellent especially for package deliveries when the owner needs to communicate with the delivery person remotely. The 180-degree wide angle lens is perfect for allowing a panoramic view of an entire area. The Luowice security camera has a couple drawbacks, including the need for a wired power supply making installation more difficult and technical. We’d also like to see smart home integration. Arlo Technologies is an American company based in San Jose California that specializes in home security cameras and has branded themselves as the luxury option for outdoor security cameras. Arlo was once a division of Netgear and is now publicly traded company despite Netgear holding a majority stake in Arlo Technologies. The Arlo Pro 2 has many different features including an IP65 rating allowing the Arlo Pro 2 to withstand intense weather conditions. The Arlo Pro is also capable of 2-way audio allowing the owner to converse with whoever is in front of the camera at the time. The Arlo Pro 2 connects to the internet via WiFi and must be connected to the base station that comes with the camera system. This camera can either be powered via rechargeable batteries or by a power cord. It is best to power the Arlo Pro 2 via power cord due to it allowing the camera to use multiple features that it cannot utilize when powered by a battery. Arlo Pro 2 works with Amazon Alexa and Google Home. Features that can be used when powered by a cord include activity zones, 24/7 recordings and 3-second look back. A fairly unique feature of this Arlo Pro 2 is its siren feature that can either be triggered remotely or can be triggered by motion or sound. The camera is outfitted with a 130-degree wide angle lens and films in 1080p HD. The camera is also capable of filming in night vision allowing for full surveillance at all times. The camera can be accessed remotely via a mobile app and send alerts to the owner’s device when motion is detected. The Arlo Pro 2 is quite expensive costing about $250 for the system and 1 camera. A 1-year warranty for hardware is included with purchase. Additional plans may be purchased allowing for more storage of recordings to the cloud and additional features. The Arlo Pro 2 sports many excellent features including smart home integration, security siren, cloud storage, 24/7 recordings, activity zones and 3-second look back. However, only some of these features can be utilized if the camera is plugged in making installation more complex. The cost of the Arlo Pro 2 is quite expensive costing about $250, for that price we would like to see at least a 2-year warranty rather than a 1-year warranty. Each additional camera will cost about $220. Cloud storage is an excellent feature but we feel that limiting the recordings to just 7 days of storage encourages users to purchase a monthly plan. Ultimately, the Arlo Pro 2 has excellent features that come at a high cost. For those looking to buy this camera system, be ready to spend hundreds of dollars on it for the full experience. Ring is an American company headquartered in Santa Monica California that specializes in home surveillance offering video doorbells, security systems, and security cameras. Ring, like Blink, was recently purchased by Amazon. 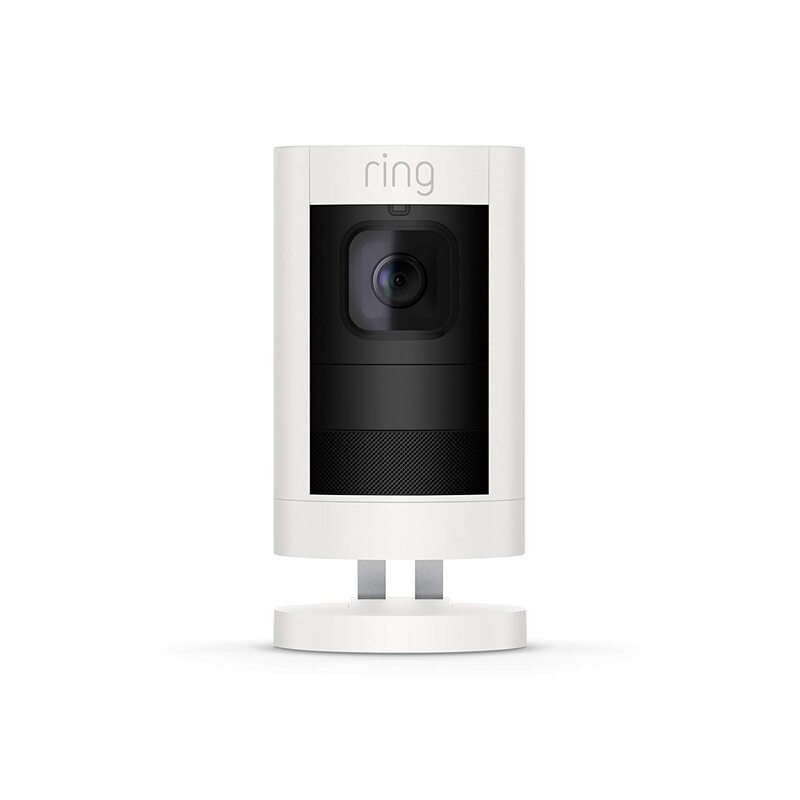 The Ring Stick Up Cam is one of Ring’s newer outdoor security cams. The Ring Stick Up Cam sets itself apart from its peers by offering two models, one that is battery powered and another that is powered by a cord. An extra solar panel may also be purchased to supplement the power for the battery model. The Stick Up Cam records in 1080p HD. The wired version has a 150-degree horizontal view and an 85-degree vertical view while the battery version has a 115-degree horizontal view and a 65-degree vertical view. This means the wired version has a larger field of view. The battery version is powered by a rechargeable battery pack that is easily removed from the camera. Motion sensors allow the camera to operate only when it detects activity, promptly notifying the owner of activity on their mobile device. Video Recordings are stored to the cloud which costs about $3/mo per device or $10/mo for unlimited devices. The Echo Show, Echo Spot, and Fire TV can also view the live feed coming from the Stick Up Cam. The Ring Stick Up Cam is weather resistant able withstand intense weather conditions. The motion detection sensitivity can only be adjusted on the wired version. The cost of the Ring Stick Up Cam is about $180 and a 1-year warranty is included with purchase. The Ring Stick Up Cam has just about all the features we would like to see in an outdoor security camera. The 2-way audio feature is excellent for communicating with any visitors at your door whether that be friends, family, delivery personnel, and total strangers. The only major drawbacks of the Ring Stick Up Cam is the differences in the camera field of view between the wired and battery version. Both models cost the same but with the battery version, the camera is limited in its field of view compared to its wired counterpart. For the cost of about $180, we’d like to see some sort of free cloud storage option for recordings. EZVIZ is a Chinese company headquartered in Hangzhou China. EZVIZ specializes in home security with many of their products focusing on surveillance. EZVIZ provides outdoor and indoor security cameras, video doorbells and more. The EZVIZ C3W is one of the best selling security cameras EZVIZ sells. This camera has an IP66 rating making it extremely resistant to the most intense weather conditions. The C3W is capable of 2-way audio allowing it to function as an intercom for the owner. The C3W has motion sensors allowing the camera to begin recording as soon as motion is detected in its field of view. The C3W will notify the owner on their mobile device once motion is detected. A siren and strobe light can be set to activate when motion is detected, effectively deterring trespassers. Infrared night vision is included that allows the C3W to see up to 98 feet during the night hours. The C3W connects to WiFi via the 2.4GHz frequency. Recordings can be stored locally on an SD card up to 128GB in size or on the cloud. The C3W is interfaced on mobile devices via the EZVIZ app. The C3W is powered via a cord making installation tricky but eliminating the need for battery charging or replacement. The camera has a 360-degree swivel base allowing versatility of options when positioning the camera. The field of view of the C3W is 118 degrees. This camera is integrable with Amazon Alexa and Google Home. The cost of the EZVIZ C3W is about $70 for one camera and a 1-year warranty is included with purchase. For the price of about $70, the EZVIZ C3W packs a ton of features that its more expensive competitors lack. A strobe light and siren is an excellent feature as it adds a higher level of deterrence to trespassers that normal security camera simply can’t accomplish. The EZVIZ app has been known to have problems but issues can be rectified with updates. The 1-year warranty is more than adequate for a product costing about $70. The wired power connection could be seen as a drawback as it makes installation more difficult. SV3C is a Japanese company that specializes in home security and sells a wide array of different security cameras that may be placed indoors and outdoors. We will be focusing on the SV3C PTZ camera that has a few key features that other cameras in the guide lack. The SV3C PTZ sets itself apart from the rest of the cameras in this guide due to its ability to pan a full 355 degrees horizontally and 120 degrees vertically via remote control. This allows the owner to actively survey their own property from every angle via their mobile device. The PTZ has 5X optical zoom allowing the owner to see closer than most outdoor security cameras. The PTZ supports 2-way audio allowing the camera to act as an intercom that can be connected to on the owner’s mobile device. Motion detection technology is integrated into the PTZ and will promptly alert the owner of any motion detected via the mobile app or email. The night vision capabilities for the PTZ outpace its competitors with a range of up to 196 feet at night. The PTZ has an IP66 rating protecting it from intense weather. Recordings are stored locally on an SD card, the PTZ can support an SD card up to 128GB in size. WiFi connection is supported on the PTZ, connecting the owner’s mobile device to the camera via the mobile app. The PTZ is not completely wireless due to the corded power supply. The SV3C PTZ costs about $140 and comes with a 1-year warranty. The SV3C PTZ is an extremely versatile outdoor security camera with its ability to pan 355 degrees horizontally and 120 degrees vertically. Along with its panning feature, the PTZ can see further than any other camera in this guide via its 5X optical zoom and 196-foot night vision range. The only major drawback of the PTZ is its lack of direct smart home integration. The 1-year warranty is adequate but we would prefer a 2-year warranty on a camera of this cost and caliber due to its moving parts. Regardless of the drawbacks, the PTZ has the best viewing range of any camera in this guide. Who Needs an Outdoor Security Camera? In this day and age, anyone can benefit from an outdoor security camera even if they have zero property that is technically outdoors. For example, many urban apartments have front doors that are located within their building. Though these front doors may be more secure, package theft is still rampant in apartment buildings, warranting the need for a security camera. Even residents living in extremely safe neighborhoods and gated communities are still subject to potential mail theft from their neighbors. For those living in rough neighborhoods that are at risk of not only theft but also break-ins will benefit immensely from a security camera, especially one that has a siren feature. Regardless of your living situation, an outdoor security camera will bring peace of mind to you and your family. The EZVIZ C3W sets itself apart from its competitors with its low cost and unique features making it the overall best outdoor security camera in this guide. For the cost of about $70, the C3W offers smart home integration, siren, strobe, IP66 rating, 2-way audio and more. The C3W outpaces many of its competitors with its unique features that can’t be met for the same price. Though a wired power supply can be seen as a hassle due to installation, it gives a peace of mind knowing that the C3W will never need to have its batteries recharged or replaced. Regardless of which outdoor security camera you choose from our guide, they will all serve their purpose by surveying your home during all hours, intense weather conditions and will promptly notify their owner when motion is detected. Evaluate your unique needs before making a final purchase.